May I present you vegan waffles that were requested by a person who thinks soy milk will kill him. 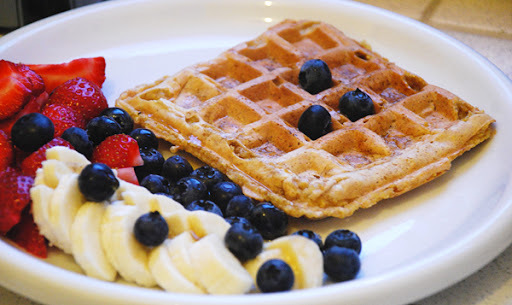 That's right, my boyfriend asked for his own waffles (Jennifer, you can do the I-told-you-so dance now ;)) when he arrived at my apartment and saw me eating these Lemon Lime Corn Waffles with the most delicious strawberries & blueberries. And here's a picture of the yummy Lasagna my mom & I made when my sister & her boyfriend arrived. I had my vegan corner and the rest had regular lasagna. We used soy creamer instead of bechamel sauce and nobody noticed. I also crumbled my basil tofu ricotta inbetween the layers and nobody complained. I LOVED my part of the Lasagna, that's for sure! Last night I made another dinner requested by my boyfriend: Potato Soup! I had my mom's potato soup in mind which was very creamy and mild in flavor, but of course I improvised (as I pretty much always do) and got out something totally different, yet extremly delicious: Curry-Potato Soup! I served this to my parents, my sister, her boyfriend and my boyfriend and everybody LOVED it! You know, when I started cooking my sister replied with an "Ew." when I said I'd be making potato soup, my mom said she wasn't hungry yet when dinner was ready everybody raved about it! Seriously, stuff like that makes me so happy, ha ha! I mean how often do you cook something and everybody likes it? I'll post pictures later, because I made a huge pot. Leftovers, hooray!!! Other than that I want to apply for an internship in Amsterdam. I have found three agencies I'll apply at and I specifically favor one of them. Oi, please cross your fingers, I am so nervous! I really really want to do this, it would be like a dream come true! MY oh my everything .... LICK!!! Good luck on your internship! What sort of internship is it? Everything in this post looks fantastic--your friends and relatives are very lucky to have such a gifted chef! Ha you're veganizing your family! The lemon lime corn waffles sound absolutely deliciuos, I think I might steal the idea. I am getting soy cream - I can hardly wait! Brilliant to use tofu ricotta, I am going to try that too. It's the best when we get others hooked on our vegan goodies! Good luck with the internship! Yay for your boyfriend coming around to vegan food. With all your amazing waffle creations it's not a wonder. 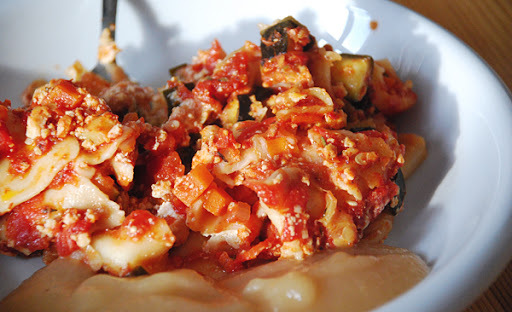 How cool that you guys were able to slip in some vegan alternatives to your lasagna and nobody noticed. Ok - that IS a little weird to me that you eat applesauce with your lasanga, but who knows, it could be good. I remember in high school when my grandma's foreign exchange student (from Germany no less), Anke, showed me the joys of mayonaise and french fries. I've grown out of that at this point, but it was one of those things that seemed really gross, but actually wasn't. Good luck on your internship, that would be a really great opportunity for you. My fingers are crossed tightly for you, girl!! Good luck!! Ha ha, the applesauce was just a weird craving I had, but it turned out to fit well. Thank you so much, I really hope so too! mad about udon - thanks! it's a graphic design internship (i'm currently in my last year studying mediadesign). mihl - slowly, but surely yeah i try, ha ha ;) i wish my dad would go vegan, simply to increase his health. i started caring a lot about him about 3 years ago and now i want him to be around as long as possible. i think i'll have him read the china study and maybe he'll make the decision by himself. that would be awesome! Nikki - Hooray, you're gonna love it. It was even better the next day because of all the flavors, mhh! Ha ha yeah I just craved it. I thought it might go well because years ago I had Käsespätzle (pretty much the german mac&cheese) with applesauce because people were insisting that it fit and was yummy. They were quite right, but I wasn't convinced at first either. 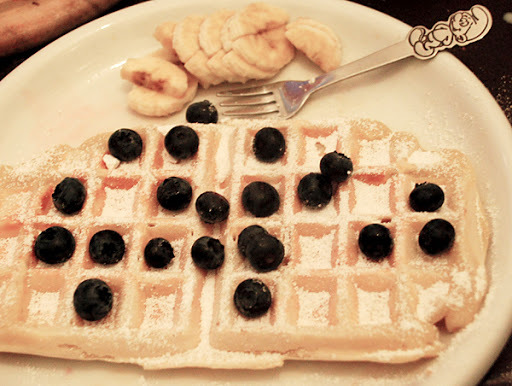 Your waffles always look so delicious! I love when my family tastes my vegan food and thinks its good because they never would believe me if they didn't try it themselves. Yeah, I think we've all been there. I really don't know what their problem is. I mean all we use comes from a natural source, yet they refuse to try it. What makes dead animals and other crap better? I'd really love to know. 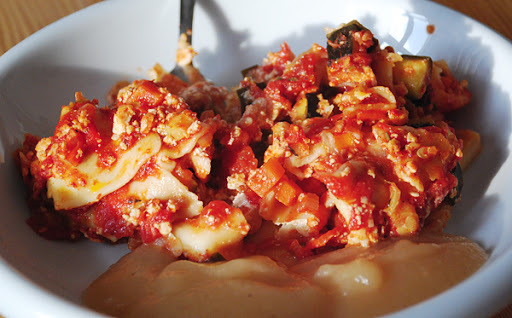 Lasagna with applesauce? I've never heard of it before, but if I happen to have applesauce around when I'm eating lasagna, I'll give it a try. Good luck with the internship!! My fingers are crossed for you! And congrats on your everybody-liked-it soup, because that is such a great feeling. And I loooove that you had all that fruit with your waffles. Fruit is so expensive, it would be a dream if I could have that many fresh berries with my breakfast every morning! wow! this all looks wonderfully fantasical! the lasagna just set off some serious cravings - and those waffles, omg! they look amazing! glad your boyfriend loved them, too! yay! your waffles are probably the most luscious ones I've ever laid eyes upon. for total serious. I love waffles but mine always stick in the "non-stick" waffle iron. Then I spend half an hour trying to get all the little pieces out, which ticks me off so much I don't try making waffles again for 6 months....and they stick. I passed on the Brillante Weblog Award to you - hit up my blog for details! Ah good luck with your interview...Amsterdam is one of my favorite cities. Your recipes look delicious. oh! lasagna with applesauce?! will I dare to try that? The waffles I would try for sure, hehe. I passed the brillate award on to you, btw! Ah, und ich arbeite in Heidelberg, in einem Forschungszentrum, so in richtung software engineering. I'll eat your vegan waffles anytime. Your waffles look amazing. I've just been looking through all your previous posts and drooling! I'm a big waffle fan too but even if I wasn't I'd be pretty inspired after seeing those. Apparently I made an impact.